Located in the grounds of ‘Rupertswood’ the original home of Sir William Clarke, the Ciantar Learning Commons is the heart of the Salesian College Campus and a rich social and academic meeting place for students. 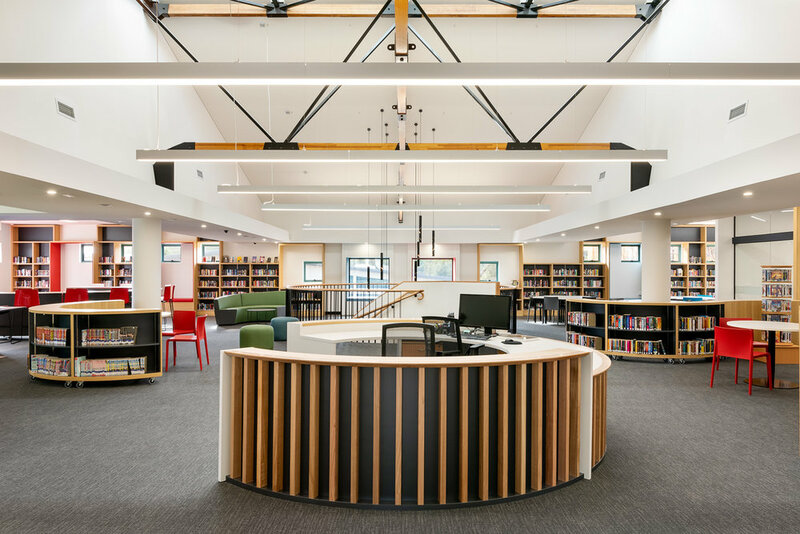 A refurbishment of the existing library building, the project celebrates the existing roof structure to provide a voluminous home for the book collection, which divide the large open plan space into a series of flexible learning spaces and study zones. Student meeting rooms and quiet spaces are further dispersed around the collection to provide a variety of learning settings for students and staff offices, including a central help desk, are integrated into the new two level Learning Commons. Colour is used throughout the interiors to define function and to provide a vibrant and engaging learning environment. Brighter and more vibrant colours are used on the Upper Level to encourage creativity and collaboration, and softer hues on the Lower Level promote concentration and independent study. A sculptural spiral staircase anchors the space and connects both levels to provide a physical and visual connection, whilst drawing light into the depth of the plan from a roof lantern above. Carefully placed windows throughout the Upper Lever culminate in a glazed box, protruding beyond the original footprint of the building, which capture the vista out towards the Ashes Oval, birthplace of the ashes urn, to remind visitors of the schools rich history.